The plenitude of environmental changes currently underway is leading scientists to devise new catchwords for communicating novel, unexpected findings. Think of plastiglomerates, a new type of stone made up of melted plastic and other materials that will likely become part of the rock record. Now, we have “jellification” — very recently conceived to describe the process causing goo balls to wash up on the shores of Canadian lakes. 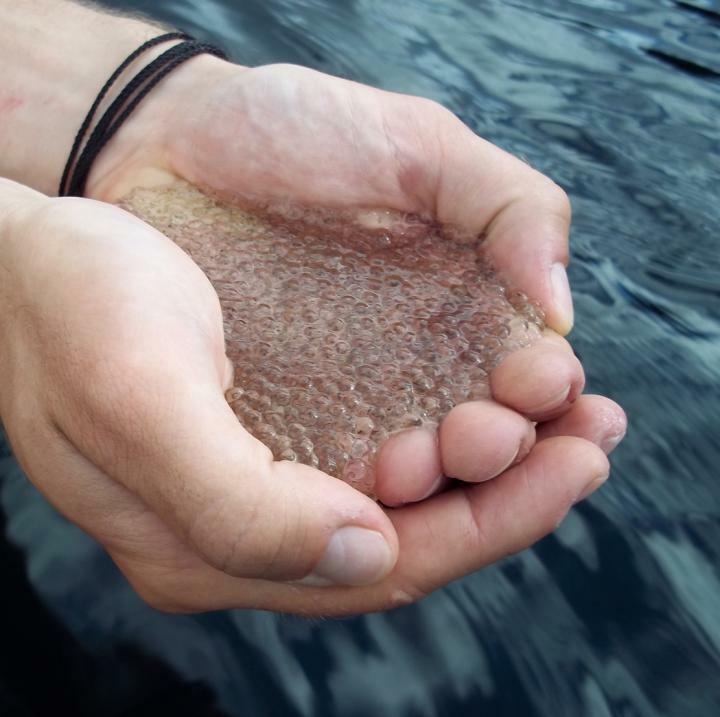 The goo balls are made up of a small planktonic animal dubbed Holopedium glacialis, which is surrounded by a gelatinous polysaccharide bubble. Holopedium is clogging up water pipes and may potentially disrupt the food chain. An interdisciplinary team of scientists has uncovered the story behind it. In a paper published on November 19, 2014 (The jellification of north temperate lakes), John Smol and his collaborators report that calcium levels are decreasing in lakes across eastern North America and western Europe. A consequence of decreasing calcium levels is the disappearance of Daphnia, a tiny crustacean less than 3 mm in size, more commonly known as water flea because of its swimming style. Daphnia is a keystone grazer in lakes and ponds — in other words, it’s part of the foundation of all healthy aquatic ecosystems. It feeds on algae cells, and represents the staple food for a variety of fish species and other predators. It needs large amounts of calcium to build its body shell. In contrast, Holopedium, a competitor of Daphnia, thrives in waters depleted of calcium. Thus, in Canadian lakes, Holopedium has taken over the room vacated by Daphnia, aided by larval midges, Daphnia’s major predator. Indeed, according to Howard Riessen and collaborators, Daphnia is unable to defend itself in presence of low calcium levels — low levels prevent the development of Daphnia’s induced defenses against the midges. Induced defenses, such as increase in body size, formation of neck spines, and strengthening of the carapace, are those that become more pronounced in presence of predators. Life is getting even more dangerous for Daphnia — climate change is causing oxygen decline deep in the lakes, creating better conditions for an increasing population of larval midges. And as Daphnia vanishes, Holopedium grows and multiplies by making a meal of Daphnia’s leftovers — uneaten algae. The calcium present in lakes derives from soil and fallen trees. What is causing the low calcium levels in lakes, then? The answer is simple — a decades long legacy of industrial pollution. Andrew Tanentzap, a researcher on the Smol paper, explained in a press release that, historically, large amounts of acid were deposited throughout the northern hemisphere due to industrialization. The acid displaced calcium from soil and, over a long period, this process pushed all the calcium out of the drainage areas feeding these lakes, causing dramatic declines in the water calcium levels. Smol and his collaborators believe that the growth explosion of the Holopedium population will not only clog up the extraction of drinking water, but also reduce nutrient transfer through food webs because of Holopedium’s lower phosphorus content. This entry was posted in Ecology and tagged calcium levels, Canadian lakes, Daphnia, Holopedium on December 8, 2014 by Integrated Environmental Assessment and Management. I’m familiar with a similar calcium depletion effect in western Oregon USA salmon habitat forest streams that are very low in calcium due to Ca poor lithology and copious leaching rainfall and snowmelt acidification pressure events. On top of this ‘given’ condition with subsequent low buffering capacity, several anthropogenic acidification pressures are pushing bioavailable exchageable calcium carbonate levels even lower. The result is pressure toward a trend for likely increased hypocalcemia in sensitive stream organisms that had long supported the salmon ecology. Freshwater mussels in many locations are having shell degradation problems from dissolution of external exposed calcium carbonate resulting in perforation and premature mortality of all age classes of long lived species that had been a significant part of the stream calcium sequestration budget that provides resiliency in the system. Natural resource extractive practices (e.g. timber removal) export calcium, lower buffering allows increased soil and water aciditiy putting more hydrogen ions into the streams causing carbonate conversion to bicarbonate that is not very bioavailable. Also, the leaching increases the mobility and toxicity of toxic metal contaminants regularly added to the streams by non point source pollution (fishing sinkers and massive lead paint pollution from degrading railroad bridges).. the lead and cadmium are wellknown calcium utilization inhibitors that add to the hypocalcemia trend. In creased atmospheric CO2 does not help either. Forestry management practice that has decreased red cedar (which is 2 to 5 times better at bringing deep seated soil calcium up) has been replaced more than prehistoric conditions by increasing the red alder % veg cover (RA being a nitrogen fixer, adds to the acidification of soils and streams). The massive tonnage of historic marine derived nutrient brought upstream by spawning salmon and lamprey no longer return to fish-fertilize the watershed garden as prehistorically, so ocean calcium does not help to counter the newer acidification pressures. The freshwater low-calcium waters in Canada and Oregon are under added ecologic stress and need careful attention to lear how to help retain more of the calcium that is now exported. How is all of this affecting the salmon? Are there measurable effects on salmon populations? And, if yes, are these the same for all salmon species? Great questions Roberta, and of course I don’t know all of the answers, but have been looking at these questions for long time. Review of the sci lit for these questions brings increasing understanding of the ecotoxicologic implications of current environmental conditions compared to historic and prehistoric conditions. As pH moves along the continuum more toward the acidic end, the toxicologic influences of many pollutants building up in waters becomes even more problematic, especially for the toxic metals. Mining, and product dispersal around the globe to inevitably become pollution, takes a huge toll on biologic systems that was not as pervasive prehistorically. Salmon are adversely affected by acute exposures to pollutants as seen in prespawn mortalities of ‘belly up’ high public profile scenarios, yet it is the far more subtle and pervasive adverse effects of chronic low dose accumulative effects that are ‘subclinical’ yet devastating to populations. ‘Belly up’ evidence of ecologic water quality degradation harm to populations is ‘newsworthy’ but only the tip of the iceburg for toxic effects and population limiting dangers hiding within the lesser acknowledged behavioral, immunologic, developmental, etc. realms of toxicology for the salmon and supportive species. Any effect that reduces a fishes abilities is a strong population limiting pressure if many individuals are exposed. there is a wealth of recent research lit that documents lab experiment health degradations in fish, yet, the application of the real world exposures and harmful effects out in the wild are far less well documented. Salmon, in the freshwater phase of their life cycles, suffer mortalities of 95 to 98% from egg to smolt entry into the ocean phase, and similar losses during the ocean phase. How much of these losses are due to pollutant effects? If we can clarify and correct some of the obvious water pollution pressures (e.g. lost lead fishing sinker, and bridge paint leaching and flaking pure lead into the waters) could we improve survival by 1%, or 2%? If so, we might relatively double survival of populations. Perhaps this could only help one tenth of a percent, but still be a very big factor in helping salmon recovery and aquatic health greatly. Existing literature supports toxic metals reduction emphasis, as well as freshwater acidification pressure mitigation. Chinook salmon, highly sought after in sportfishing (and fisheries management emphasis), spend far less time in freshwater than the other species do. This may be important in limiting exposures to them compared to the other species, from freshwater pollutant accumulative effects. Chinook are seemingly doing better population wise. NOAA Fisheries contaminants people, and Washington State U, have been doing great work looking at stormwater runoff from highways associated with Pre Spawn Mortality (PSM) of coho. They have documented four hour exposure to raw stormwater with subsequent salmon death. When filter systems simulating rain gardens were used, the waters had much less effect on the coho. They have been trying to create a replicate of the sample water to try to tease out the causative factors, but last I heard they had not gotten waters that showed the runoff water effects for mortality. It might be they used only dissolved phase metal contaminants, without using elemental colloidal metals (e.g. Pb and Cu) as additional exposure directly to sensitive gill and gut tissue exposure, where more concentrated doses might be created by dissolving on the tissue, or perhaps taken into cells directly. I suppose there may also be such small particulate size as to be nano metals to deal with as well. Episodic dips in ANC, Hardness as CaCO3, and pH may be causing freshwater acidification of low calcium salmon streams of the mid coast Oregon, and result in trending hypocalcemia in low calcium sensitive species that are supportive of the salmon ecology. How are the salmon likely being affected? In a nutshell: they are probably a bit ‘dumber’, and a bit less fit for survival. I’m wondering whether or not agricultural limestone can be used to replenish dwindling calcium in waters, at least short-term. I can see how the approach may have limitations, I guess because of variability in limestone composition, which depends on the geological source and on the way it is processed. I also imagine that the approach may work only for restricted areas, at specific locations. If calcium depletion is so widespread, there may not be enough limestone to satisfy the need. Re: lime added to waters. A lot of work on the feasibility of adding limestone to acidified waters has been done in Scandanavian countries, and found to be only minimally helpful at specific local sites. it was very expensive, took a very large amount of rock, and a lot of work. Also, many geographic acidified areas are by definition regions low in limestone anyway, which causes a lot of logistical problems to import lime. Dan Weber, a researcher on toxic metal lead toxicity of fish, has done a lot of clarification of chronic low dose behavioral effects in fish caused by lead exposure. A Google search of his work is quite enlightening, and a cause for great concern for low calcium salmon waters being at much elevated risk for toxic metals behavioral effects that are high potential for being population limiting.Lead affects very many physiologic pathways in the body that are health limiting, but the behavioral effects at low dose are very troubling for both fish and humans. One point about the potential for adding calcium availability to at risk watersheds: There is building concern on the left coast that road de-icing salts are becoming more prevelent, and there may be a subsequent increase of problematic water quality pollutants associated with this dispersal. Freshwater mussels are an example of organisms that be greatly affected. Perhaps, there is some opportunity within a bad situation. Red rock volcanic cinders have been historically used by road crews to give better traction on ice and snow road surfaces, it might be possible to fairly easily add crushed limestone in with the cinders. The slow release of the Ca via leaching could, over time, add to an increase in buffering in streams. This may be somewhat better than the additions of massive quantities of various road salts commonly applied… the cinder dispersal process is already happening and could possibly be used on a wider geographic area, and possibly even comparatively cost efficient…. especially if a realistic cost benefit analysis takes in the value of protecting ecosystem services that the stream organisms saved provide. Seven publically owned railroad bridges are badly degrading and dumping huge quantities of lead paint-derived contamination into a coho salmon stream. A sample of rainwater running off of one of the bridge members was collected and tested. The rain was estimated to take only about a minute at most to run down the member into the sample bottle. Analysis showed 117 ppb dissolved Pb, and 7840 ppb total recoverable Pb. Hundreds of streams of water cascade off of each bridge when it is raining heavily. Just this one runoff sample is about sixteen thousand times the water quality criteria for protection on the river water that only has a hardness level of 11 mg/l as CaCO3. The dissolved and particulate Pb in the total recoverable Pb portion appear to be an environmentally significant risk to aquatic health downstream of the uppermost of the seven bridges. This lead particulate continues to dissolve as it moves downstream contaminating increasing amounts of water. Lead is a well known calcium utilization inhibitor which exacerbates the very low calcium stream conditions, trending toward hypocalcemia in sensitive salmon supportive species. Low calcium waters are at much increased risk of lead pathology. Almost all of the sci lit for toxicology of lead, and other hardness-dependent metals effects, involve research using water hardness of much higher buffering ability and with more calcium and magnesium availability than the very much more ‘at risk’ waters ranging from 20mg/l down to 6 mg/l (and likely even lower during buffering challenge events). Research does not get done at these levels because few natural waters have such extreme calcium characteristics. Most toxicologists don’t have much experience dealing with the additonal considerations for ecotoxicology that these geographic areas present. Lead is very well known to be very toxic, even at chronic low dose accumulative effects levels. A very great number of physiologic pathways in the body are affected. Many effects are very subtle yet population limiting. The work that has been done at very low dose levels, in water of fairly low hardness/ANC indicate increasing toxic effects. When natural resource managers and water quality responsible agencies refer to toxicologists and the sci lit for guidance about the ecotoxicologic risks in the field, it is easy for them to tend to minimize the risks because they don’t understand the importance of the low calcium distinction.